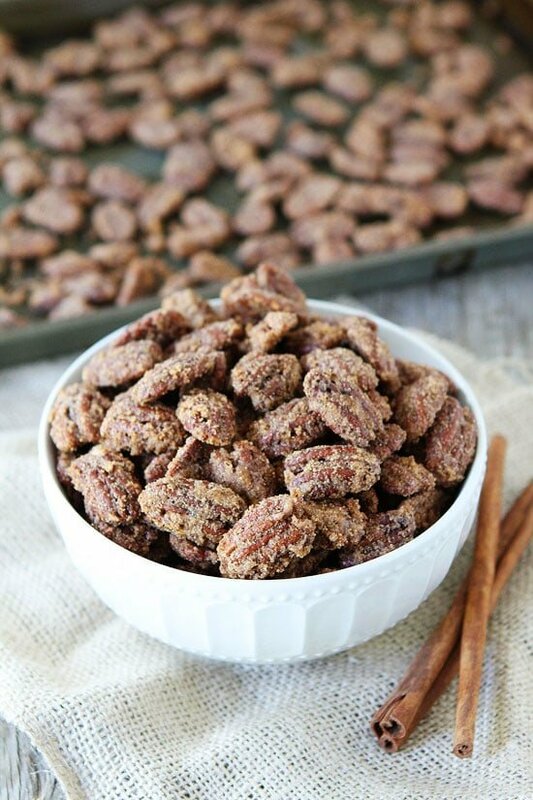 Candied Pecans-an easy recipe for Cinnamon-Sugar Candied Pecans! They are the perfect topping for salads, main dishes, desserts, or grab a handful for a snack! They are also perfect for gift giving! I am obsessed with the scented wax melts. I have a drawer full of them and keep buying more when they are on sale. I love trying new scents. I always make Josh and Caleb sniff every scent in the store. Josh humors me and plays along, but usually turns up his nose at 98% of the scents. Caleb usually loves them all and encourages me to buy them…so I do! I want our house to smell good when friends walk in the door! I found a new favorite scent and it isn’t from a scented wax melt, it is from baking a batch of Candied Pecans. If you want your house to smell amazing, put a batch of Candied Pecans in the oven! Your neighbors will be knocking on the door to see what is happening in your kitchen. They smell SO good and they taste even better! I especially love making candied pecans during the holiday months. I love the cinnamon aroma and the candied nuts are perfect for holiday recipes. They are a great topping for salads, main dishes, and desserts! They make everything taste better! They just add something special and that is what the holidays are all about! I also love eating them by the handful. They are crunchy, sweet, and make a great snack! Candied Pecans are also EASY to make, which is a big time bonus during the crazy holiday months. You can pop a pan in the oven in a matter of minutes. You have to stir them while they are baking, but the smell will keep you close! You won’t want to go far! And come back next week because I am sharing two tasty salads that feature candied pecans! 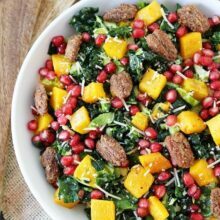 You will want to add these salads to your holiday menus. I promise! 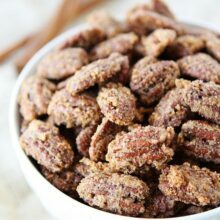 Candied Pecans are a great topping for salads, main dishes, and desserts! They are also good eaten by the handful and make a great gift during the holiday months! I love the idea of making these gift giving from the upcoming Thanksgiving/Christmas season. They would make a really nice hostess gift for Thanksgiving most of all (not that anything makes up for all that work, but ya know I try). It’s nice to be able to bless lots of people with a sweet gift that doesn’t cost a ton. My husband and I literally spend HOURS smelling candles in the store! And we light a nice scented one every morning. So that alone is enough to make me want these. It doesn’t hurt that candied pecans are BOMB. Pinned! I love candied pecans! Growing up in the south, I’ve ate my weight in them many many holiday seasons. I’ve never thought about giving them as gifts, but they would make a fantastic gift! One of my favorite holiday snacks! I like to bring them to work to share around Christmas. Always a big hit! How long do you think these would really last? This would be something different – and yummy – to make this holiday season! these really do smell amazing and they are perfect for last minute gifts and snacks and toppings of salad! If you go to On the Side at the top, you can find all of our This and That posts! I Love scented wax too – my favourite is the oatmeal cookie — yuuummm!! Yes! Yes! Yes! I just found your site yesterday and I’ve already racked up enough recipes to try to keep me cooking until the end of the year. Thank you for the inspiration. Candied pecans or nuts of any kind are always great for so many things, especially gift giving as you mentioned. Although, pecans are my favorite so I just want to stuff my face with these. These are fantastic, such great snacks and holiday gifts! Reminds me of Christmas growing up! My grandmother also made PENUCE which is similar. My Step-Mother would love these!! Well, me too….but she was my first thought as to gift giving. Pinning it!! These look so perfect! What a great homemade holiday gift! Mmmmm! Candied pecans are one of my favorite things ever!! Oh, can I have some? Please?? They look delicious! Could I make them into a candied nuts mix, with maybe pistachios and almonds? Or won’t they taste as good? 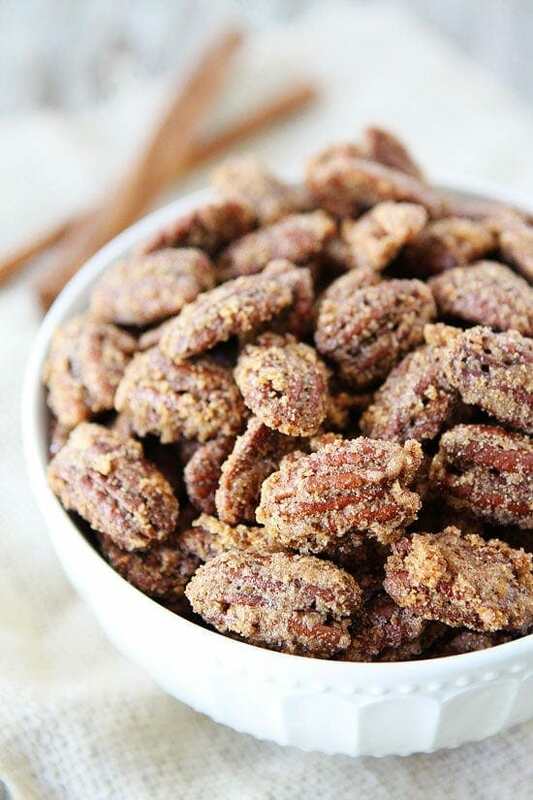 Pecans can be expensive, do you have any tips on where to find them in the Salt Lake Valley? I watch the sales. Sprouts has good deals sometimes in the bulk bins! I couldn’t be anywhere near these. I am not sure I could control myself. I love pecans and this type of a treatment is soooooo good. Packaged up cute they make great hostess gifts and even stocking stuffers. Yes….the smell is amazing! I love it when you walk past one of the street vendors in New York and you try to resist picking up a bag of their sweet roasted pecan or other nut they might be roasting. I love these! I use them on top of sweet potato casseroles and other sweet potato dishes for Thanksgiving. So good! Perfect Dessert for my Vacation 🙂 Thanks! They look & I’m sure smell & taste wonderful! However knowing me & my entire family, I have my doubt seriously that your panfull might last all of 10 – 15 minutes! I may try making them, then when someone comments, I’ll just tell them that it really IS a candle!!!! 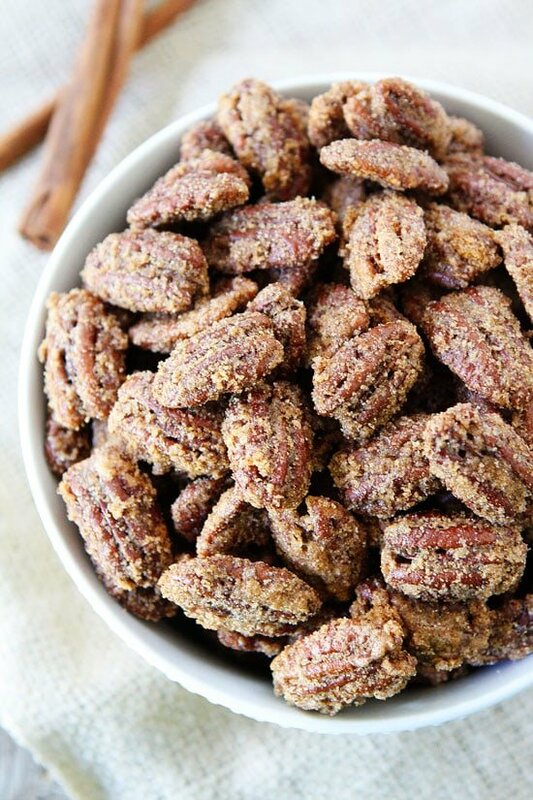 Do you use raw pecans or already toasted pecans? Can you tell me, would you recommend adding a little heat to these such as some Cayenne? I am thinking of using them as you suggested in your Mexican Wedding Cookies and I thought just a little kick might be nice as we are taking them to a Mexican Fiesta at a local brewery and the spice might add to the flavor and cut the sweetness just a little to go with the beer? any suggestions? Made these and they came out perfect! We use put them on warm Brie with salted caramel sauce, served with crackers or apples – so good – also on salads and anything else we can think of! Thank you for the recipe! That sounds so good! Glad you like the recipe! These are soooo good and too easy! Yikes!! I will try this recipe, sounds delicious! do you have any same recipes involving walnuts? I have ton of them! I don’t, but you could try candied walnuts! I made these over the weekend for coworkers and they LOVED them! Yay! I wish we had Aldi in Utah! My family loved the first batch I made for Thanksgiving so much, I just had to make another! My neighbor’s pecan tree produced so many this year, she was generous to let me pick to my hearts content. That was early November & I’m still picking! I raise rescue orphaned & injured squirrels for Gulf Coast Wildlife Resue. I first started picking pecans for them, then found your recipe. We are all delighted. Thank you! You are welcome! I am jealous of your pecan supply! I just made these last night and oh.my.goodness! They are dangerously delicious! It’s taking all of my willpower not to eat them all! Going to have to make more to give as gifts their that good! Another great recipe as usual! Thanks! I made these a couple of days ago, and can testify that they are impossible to resist! I keep finding reasons to go into the kitchen so I can grab a few! I just made these this morning after years of wanting to, but never taking the time! I can’t wait to enjoy some on a salad for lunch and to give away as Christmas presents! My family loved these! A new favorite family recipe, thanks! Have you heard of Scentsy? (Flamless wax warmers and wax melt bars.) They have a scent, Central Park Pralines, that would likely smell very close to these nuts while baking. I burned a batch of pecans with this recipe by using the recommended temperature and recommended time, though I actually pulled them out about five minutes early because I could smell the burn. The rest, with reduced time in the oven, were better, but I actually prefer another recipe I’ve used that uses only white sugar. That recipe also recommends a temp of 250. This recipe is based in SLC which has an elevation of 4200′ and requires higher temperatures. If you are cooking these at sea level, a temperature of 250-275 is more appropriate. At elevations over 3,500 feet, the oven temperature for batters and doughs should be about 25 degrees F higher than the temperature used at sea level. As elevation rises, air pressure falls, which means that bakers living at 3,000 feet (1,000 meters) will see different results than lowland bakers. Thanks for the great recipe! I used a pound of “fancy mixed nuts” from Trader Joe’s. hmmm.. I made these for Christmas and my family wasn’t very into them. For one, there’s a little too much cinnamon in (on) them. Also, a little too much salt. I loved the consistency but that was it… probably won’t make them again. These are even great when you over cook them by 15 min! I shall try them slightly less burned next time. These are SO addictive! We sampled something similar to these at one of the booths in the farmer’s market. My kids (five years old) LOVED them. So, when we got home I did a quick search and found your site. Quick, easy and delicious. Thank you for a yummy treat. The temp was too high, after 25 minutes the ones all around the outside were burned 🙁 and I stirred every 10 minutes instead of 15. The flavor of the unburned pecans was AMAZING, though. So, I’ll play with the temperature a little next time. I love the saltiness of them as well, it definitely complements the cinnamon. Whoa!!! Whoa!! let me tell you.. my neighbor a fews ago made these for me and my daughter for Christmas. I though we were about to be on the NEWS , we were fighting over these things.. They are so Delicious. Never heard of them Never had them. I found a recipe and I made them for a few people, They Love them. Only draw back Whoa!!! Pecans are expensive!!! But Worth it.. I made this and agree with some others, that I will lower the temp next time. How long will these be “fresh” tasting after putting in airtight containers? I would like to make these ahead of time and package them as gifts. They will keep for 1 month in an airtight container. Why would you bother saying “Lasts up to one month”? Like THAT is going to happen! (One week max in my house!, maybe less!) These are awesome. I am addicted to this recipe. It is the best flavor and so easy…. I have made this recipe multiple times and these are simply delicious. I’m a caterer and I use the pecans specifically for my apple gorgonzola salad. 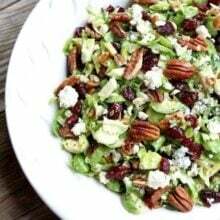 Needless to say, often times we graze on the pecans and finish them before they ever make their way onto a salad, so this recipe is always nearby. Thank you for sharing it! P.S. – People… DON’T change a thing in the recipe. It’s perfect as it is. But DO check your oven often if you don’t trust it for any reason cuz these babies will burn quickly if not attended. I used this recipe for my WEDDING Favors at each place setting. My fiance (now husband) and I tried a few recipes an decided that this one was the winner. We baked 15 pounds of these candied pecans and packaged them into cute little favor baggies. The guests loved them and were amazed that they were homemade. Added bonus – they are as economical as they are delicious. I am so happy you liked our recipe enough to make them at your wedding! Thanks for letting us know. Best wishes to you! Yankee candle makes a candied pecan tart that is out of this world. So if you want to have your favorite fragrance with out the cooking go for it..I can’t wait to try your recipe.thanks. Last year, these were the final treat that we made (after the cookies and special Christmas bread). We had some leftover walnuts and almonds, so we mixed them in with the pecans. They were just as delicious! Thanks for a delicious candied pecans recipe! 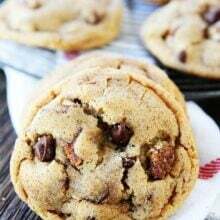 I am giving away two portions of this as gifts and then used some of the remaining pecans in your candied pecan chocolate chip cookies recipe. And there are still pecans left over. Looking forward to making these again around Christmastime. These are soooo good! I add a wee bit more cinnamon because you can’t ever have too much. It would be great for gifts…if you can bring yourself to share them. I needed a substitute for pecan pralines for s cheesecake topping. I chopped the pecan but otherwise followed the recipe exactly. They are perfect and delicious! I’ve made this recipe dozens of times! So that means I’ve visited this page dozens of times!! Think I might have it memorized now 😉 Family and friends request these nuts as I make tons and gift them in mason jars. A thoughtful and homemade gift everyone loves! So just a note to say THANK YOU for this amazing recipe!!! Hi. I would love to try these.. if I halved the recipe, how much do you suggest I adjust the time/temp? Great Recipe! Easy and delicious. My family snacks on these and gobbles them right up. First batch some of the pecans burned; I did the full 45 minutes. However, the 2nd batch turned out much better. I baked them for only 36 minutes. Perfect! You might want to put a “warning” in the actual directions. Thanks for sharing this recipe. What would u use in place if the gee white for vegan?? So good and easy to make! Everyone wanted the recipe! Yes, I tried to make these. But at 300° and only 30 minutes , they burnt. I made these last year and the came out beautiful . What did I do wrong ? At 300°and only 30 minutes , they burnt. What did I do wrong ? Weird, I have never had them burn and I have made them a million times. Maybe your oven is off? These are the best candied pecans I have ever made. They are so delicious, I can hardly wait for them to cool to eat them. I have made them several times now, and everyone ask me if I will make them a batch for the present. The very first time I made them, I was simply amazed at how it made the whole house smell so yummy! For sure double this recipe. These are super good and really easy. I think next time I’ll use my good salt and up the measurement just a tad for a little more salty & sweet. But I made them according to the recipe and they are delicious as is. will definitely be making again. and again. Made these with pecans I had left over from Xmas baking. Can’t stop eating them! These was such a hit for my family at Christmas!! These are super yummy and easy. I combined the sugar mixture in a gallon Ziploc bag and tossed the egg coated nuts that way. I will defintely save this recipe! Thanks. I made that recipe for Christmas and it was a big success in my family! Even people not really into sweets and sugar were drawn to the bowl and it didn’t last very long! And ohhhh, the smell while they were in the oven… A-MA-ZING! I have made this recipe for my church function and it was a hit. Everyone loved it. Thank you for this recipe. The candied pecans recipe is excellent. I made them for Christmas and I am making them again, my family loves them. Thank you for the recipe it is easy and enjoyed! I have made these twice now and the recipe is delicious! Makes a great gift! My go to candied nut recipe! Sooooo good!! 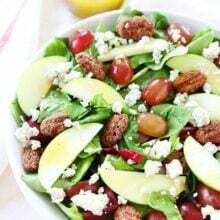 These pecans are delicious and a perfect addition to a Summer salad made with spinach, baby greens, fresh strawberries, feta cheese with a balsamic dressing. Great recipe I’ve made 3 batches in 1 week because I can’t stop eating them. Like red hots I put these s%#ts on everything! I just made these for the little cafe where I work. Delicious. Thank you for sharing! I made these for a sweet table for my son’s wedding. They didn’t last till the wedding I will be making a triple batch and hiding them along with a couple of other family favorites like Carmel corn. We were looking for sweets that were easy to handle and that would stand up to the September Florida evening heat these are among family favorites that fit the bill. them they get better n better. I’ve made them 6 times already. I love to snack on them. Thanks for the recipe. These are the BEST pecans I ever had. They just melt in your mouth. Took them to game night with friends. Everyone loved them. One guy had to move them to another table because he couldn’t stop eating them. These are the BEST pecans I ever had. They melt in your mouth. I took them to game night and everyone loved them. One guy had to move them because he couldn’t stop eating them. So good!! Only wish I could get about 2-3X more of the candy coating on there somehow. But these are wonderful. Thanks for the recipe! Thank you for this recipe. I’ve already made them three times. Sadly, we did not give them away-WE ATE THEM!! I made these today for a cookie exchange, baking is not really my gig. OMG they are greatness. Thank you! 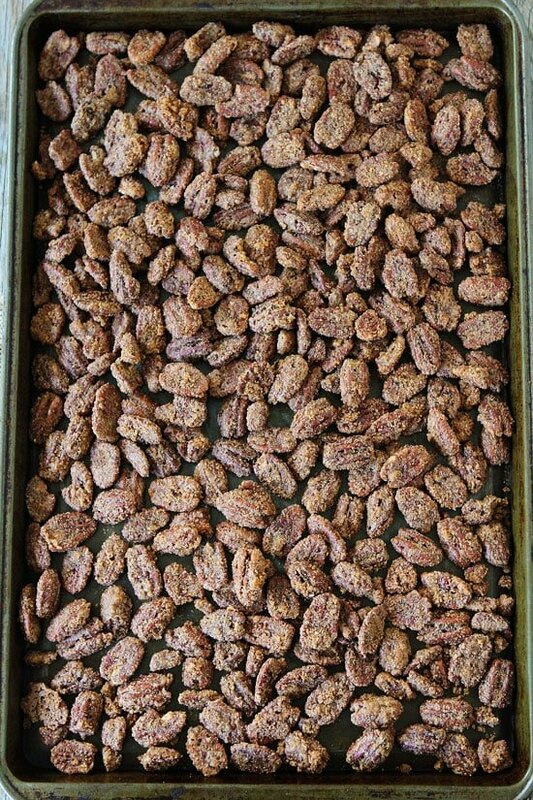 I come back to this recipe for Candied Pecans year after year. In my case, 300 degrees for 30 minutes, stirring every 10, is perfect. Especially at Christmastime, they’re tasty hostess gifts, family gifts, party favors, appetizers… Every person I’ve given them to, young and old, raves about them. Many ask for the recipe and I direct them here. Thank you for the wonderful recipe! Just made these today to use as topping for the ice cream I made with my KitchenAid attachment. My oven is down. Can I make it in the stove top? Just before I put these in the oven, I drizzled the pecans with an aged Balsamic vinegar…! It worked, just a hint of sour made these spectacular. My friends and family cannot get enough of this recipe. These are absolutely delicious. Should I even bother cooking them without parchment paper? Could I use aluminum foil? Hi why do we need to use vanilla extract? I think cayenne would be a great addition for a little kick!